ww2dbaseOmar Bai Chongxi was born into a Sunni Muslim family of the Hui ethnicity in Guilin, Guangxi, China; his family had descended from a Persian merchant by the name of Baiderluden, which had been Sinoized to Bai at least several generations prior. He enrolled in the Guangxi Military Cadre Training School in Guilin in 1907, where he came to meet Huang Shaohong and Li Zongren, both of whom would become leading figures in the Chinese military and political scenes in the future. At his family's insistence, Bai withdrew from the military school and attended the Guangxi School of Law and Political Science. After the Xinhai Revolution began in 1911, he joined in a student unit of the rebels under the command of Huang Shaohong and eventually made his way to the Second Military Preparatory School at Wuchang, Hubei, China, graduating in 1914. 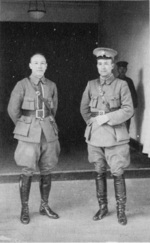 In Jun 1915, he began studying at the Baoding Military Academy in Hebei, China. Returning to Guangxi upon completing his studies at Baoding, he was assigned to the 1st Guangxi Division as a probationary officer. Together with Huang Shaohong and Li Zongren, the three formed the New Guangxi Clique which struggled, successfully, to gain power from the older warlords in the Guangxi region on behalf of the Republic of China. During the 1926 to 1928 Northern Expedition, Bai held the post of the Chief of Staff of the National Revolutionary Army; it was in this campaign that he began to earn the reputation as an able tactician, earning him the nickname Xiao Zhuge which likened him to the famed military advisor Zhuge Liang of the Three Kingdoms era. He also personally led the Eastern Route Army in the conquest of the cities of Hangzhou and Shanghai; he would be placed in command of the garrison of the latter and in that role would oversee the bloody purge against the communist elements in that city. In Jun 1928, in the recently conquered city of Beijing, he announced that the Nationalist forces would push on into northeastern China, also known as Manchuria. In Dec 1928, he was involved in the plan to dispatch 60,000 Chinese troops to the western Xinjiang Province to construct a railroad for the purpose of border defense against Soviet encroachment. In 1929, Nationalist leader Chiang Kaishek began to purge the party of potential political opponents; Bai fled to Vietnam briefly as a precaution, but he would remain influential and would survive the purge. 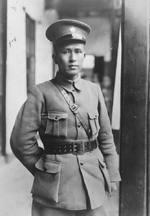 Between 1930 and 1936, remaining in a leadership position in Guangxi, he became known as a capable civil administrator. In this capacity, he was successful in rallying the Hui minority and Chinese Muslims to join the Nationalist government's cause. ww2dbaseWhen WW2 began in China on 7 Jul 1937, Bai formally rejoined the Nationalist government upon the invitation of Chiang Kaishek. As the Deputy Chief to the General Staff, he was among those who persuaded Chiang to adopt a trading-space-for-time strategy against the Japanese invasion, using guerrilla tactics rather than head-on military confrontations to wear down the Japanese. In 1938, he was named the Commander of the Field Executive Office of the Military Council of Guilin, taking responsibility of the 3rd, 4th, 7th, and 9th War Areas; in this role he oversaw the successful defense of Changsha, Hunan. At one time he was considered to be the most likely candidate among military leaders to be Chiang Kaishek's successor. ww2dbaseAfter WW2, the Chinese Civil War between the Nationalists and the Communists resumed. Bai was named the Minister of National Defense in Jun 1946, a powerless position and Chiang consolidated all military authority in himself, issuing commands to lower levels without going through the chain of command. In 1947, he was dispatched to Taiwan as Chiang's special representative after the 228 Incident during which the tension between mainland and local Chinese escalated to a violent level; Bai blamed the Nationalist government for the incident and granted amnesty to the Taiwanese. In 1948, he was removed from his post as the Minister of National Defense and was placed in command of troops in central and south China. While in late 1948 he still abided by Chiang's orders in the refusal to negotiate with the Communist forces, by Jan 1949 he had changed his mind, publicly demanding otherwise and refusing orders to engage communist forces in the Huai River region. Shortly after, he further demanded his Guangxi units to be released from Nationalist duty and returned to his personal command so that they could defend their home province. He would go further and demand Chiang to step down. Upon the defeat at Hankou in Hubei Province, Bai led the Nationalist troops in falling back south to Hengyang in Hunan Province. In Oct 1949, still in command of 200,000 battle-hardened troops, he prepared Guangxi Province for a final stand against the Communists, but ultimately he would flee to Taiwan with the remainder of the Nationalist government. ww2dbaseIn Taiwan, Bai retired from the military. He served as a special adviser in the Presidential Office and a member of the Central Executive Committee of the Nationalist Party. In 1951, he made a call to Muslims around the world to fight against Communism. He passed away on 2 Dec 1966 of cerebral thrombosis. He was given a funeral with military honors, and he was buried in the Muslim section of the Liuzhangli Cemetery in Taipei, Taiwan. 18 Mar 1893 Bai Chongxi was born in Guilin, Guangxi, China. 4 Apr 1927 Bai Chongxi purged communists from the Nationalist Chinese garrison in Shanghai, China and a number of labor leaders in the city; many of them were executed. 2 Dec 1966 Bai Chongxi passed away in Taipei, Taiwan, Republic of China.